The creativity of rich individuals and their tax advisors to hide private wealth in tax havens, such as the Cayman Islands or Switzerland knows hardly any bounds. Just as unethical, though often legal, are the multiple techniques multinational corporations use to shift profits to low-tax jurisdictions such as Panama or Bermuda. And even though small states have a structural advantage when it comes to engaging in tax competition, that is, attracting capital from abroad, big economies have become adept at playing the game, too. The United States, Germany, and with the Cayman Islands and Jersey, two jurisdictions politically dependent on the United Kingdom all feature in the top ten of the Tax Justice Network’s 2013 secrecy index. As illustrated by widespread media coverage and numerous civil society campaigns, tax avoidance offends people’s sense of justice. Tax competition is part of a wider trend of the isolation of economic forces from electoral pressures under capitalism. The mobility of capital in an environment of deregulated markets allows capital owners to extricate themselves from the social contract. They benefit from public goods and infrastructure without paying their fair share. This trend undermines fiscal autonomy and it contributes to rising inequalities in income and wealth. We can distinguish three types of tax competition that target portfolio capital of wealthy individuals, paper-profits of multinationals, and foreign direct investment (FDI) respectively. What should be done about these phenomena from an ethical perspective? First, all forms of what the OECD has called ‘poaching’, that is the intrusion or free-riding by one state on another state’s tax base, should be eliminated. This rules out the first two types of tax competition previously mentioned, and thus would put an end to both individual tax evasion and corporate profit-shifting. Yet, there is a hic. Once you prohibit fiscal free-riding of this kind, the incentives for individuals and, in particular, for multinationals to actually relocate to a different jurisdiction, will increase markedly. If Apple and Starbucks and you-name-your-favourite-multinational can no longer reduce their effective tax rates to a fraction of the nominal tax rate in many countries, they will be more likely to move their activities (and jobs) to low-tax jurisdictions altogether. Incidentally, this is one of the reasons why the governments of rich countries have tolerated the injustices of poaching: they are afraid of the economic fall-out from closing loopholes. Second, therefore, we have all the more reason to develop an ethical perspective on the third type of tax competition, the competition for FDI. What, if anything, is wrong for instance with Ireland’s low corporate tax rate and the fact that it attracts a disproportionate share of FDI in the European Union? Such policies should be prohibited when two conditions are jointly met: first, when the policy is strategically motivated, that is when it specifically targets attracting capital rather than pursuing independent political motives; and second, when it is effective in doing so, that is when it results in a net capital inflow to the country that adopts the policy. Regulating the competition for FDI is admittedly more complex than regulating the two forms of poaching. However, note that our current practices in international trade are very similar to what is proposed here. The World Trade Organisation (WTO) prohibits subsidies, because they undermine the level-playing field of international trade. Since a tax break and a subsidy are but two sides of the same coin, coherence calls for a regulation of the competition for FDI, too. Whatever the precise contours of a regulation of tax competition, it requires a multilateral solution. This in itself presents a non-negligible challenge, since such a reform will necessarily produce winners and losers. The creation of an International Tax Organisation (ITO) with powers similar to those of the WTO would be an effective means to promote reform. Some are likely to object that regulating tax competition risks being inefficient and / or violating national sovereignty. With regard to efficiency, on the contrary, the loophole characteristic of tax competition tend to favour an inefficient tax mix. As to sovereignty, any modern understanding of the concept recognises that the protection of sovereign rights comes with the obligation to respect the equivalent rights of others. From this perspective, shoring up the effective fiscal sovereignty of states calls for a regulation of tax competition rather than being opposed to it. Featured Image Credit: British budget business by PublicDomainPictures. CC0 Public Domain via Pixabay. Peter Dietsch is Associate Professor at the Université de Montréal. His research interests lie at the intersection of political philosophy and economics, with a particular focus on questions of income distribution as well as on the normative dimensions of economic policies. 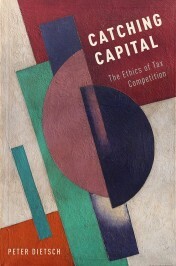 He is the author of Catching Capital: The Ethics of Tax Competition.